Home » Service Manual Catalog » EPSON Service Manuals » InkJet Printers » SL-D700 I have paid for Reset Key but not received yet. Epson Sure Lab SL-D700 printer Service Manual New! 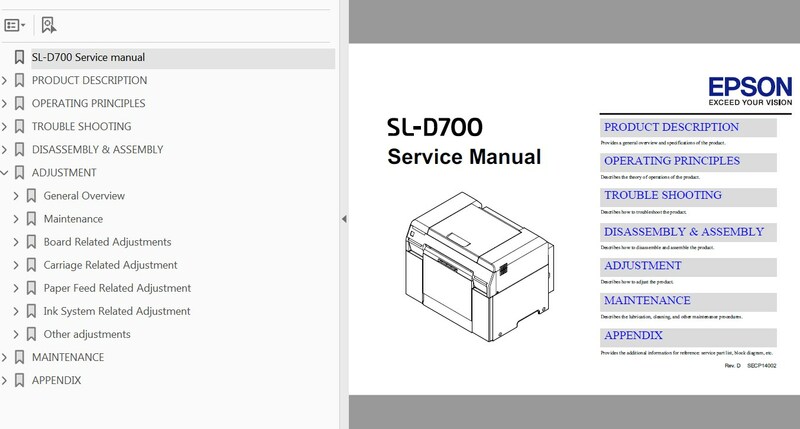 This Epson Sure Lab SL-D700 Service Manual describes basic functions, theory of electrical and mechanical operations, maintenance and repair procedures of the printer. Describes the theory of mechanical operations of the product. Describes the disassembly/reassembly procedures for main parts/units of the product. You can download free first 9 pages of Epson SL-D700 Service Manual. Thank you so much! I saved two trips to the service center and saved more for the charges and time spent!!! thank you for fast respond I will recommend you to all my friends in Iran and Emirate UAE You are the best and god be with you! Notify me of updates to Epson Sure Lab SL-D700 printer Service Manual New!